IE Business School and the Master in Management will be launching the 1st edition of the MiM GAMES, an event that will bring together MiMs from around the world for a fun weekend. So far, 17 leading MiM programs have been invited to this first edition. 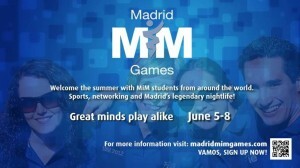 The MiM Games will consist of an event full of sports, friends and fun in Madrid. Next June we will welcome the summer season with an action-packed get-together. MiMs will be able to participate in a variety of sports, sample Spain’s gastronomic marvels, and share the world’s best nightlife with other MiMs. Between Thursday afternoon June 5th and Sunday 8th, IE will welcome hundreds of other MiMs from around Europe. During the day, we’ll have various competitive sports and recreational activities. In the evenings, we’ll unwind in some of Madrid’s trendiest nightspots. Of course, for our MIM students June 6th there won’t be any classes scheduled! Around 800 MIM students. An alumni network that spans school boundaries. A legacy beyond sports…this is the IE Madrid MiM Games 2014!